Let’s talk about 5 big decorating mistakes and ways to fix them! We all make them but the magic lies in how to correct them or how to avoid making mistakes in the first place. Here are 5 of the most common decorating mistakes we make and ways to fix them. 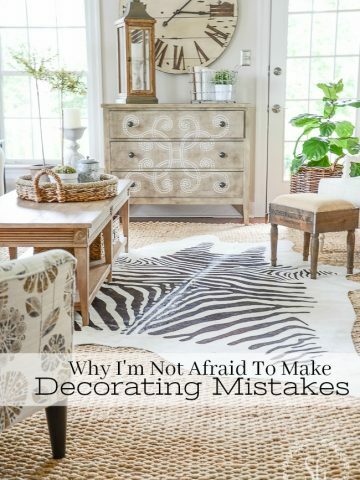 Undoing some decorating mistakes are easy but some are hard to correct without costing a good deal of money! 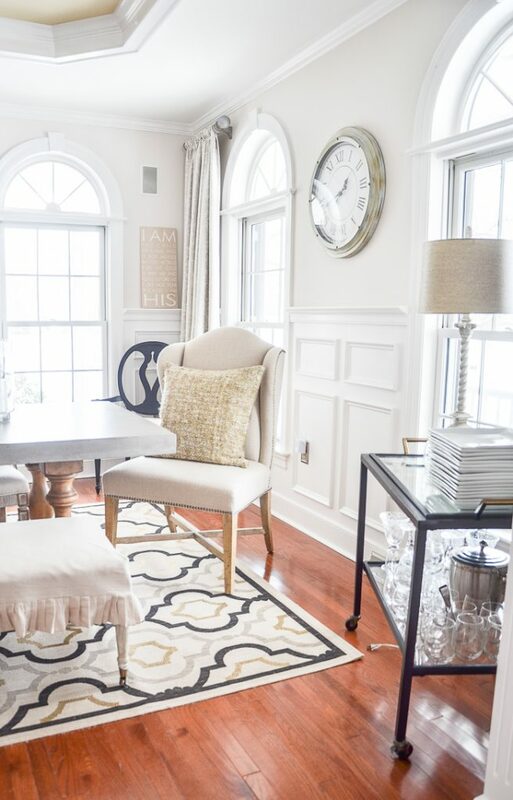 Today, I’m sharing 5 common but BIG decorating mistakes that you can avoid making. And if like me, you already have made these mistakes so I’ll show you how can fix them. Choosing the perfect paint color is not an easy task. But most of us know rather quickly if the paint color we have chosen is all wrong for a room. I think choosing the wrong paint color is probably the most common mistakes home decorators make. UGH! And it can be both costly and time consuming! Go see 6 TIPS FOR CHOOSING THE PERFECT PAINT COLOR. This post expands on the tips above and guarantees paint color perfection! And you can see the colors I use at StoneGable. 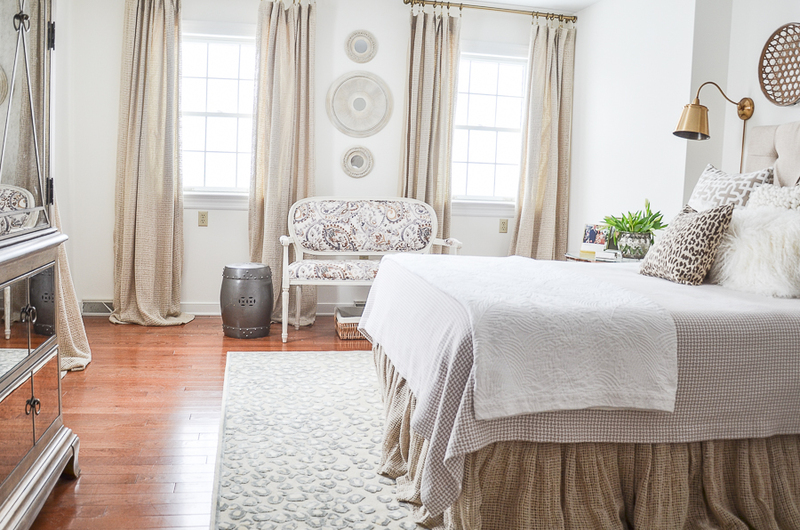 The rooms in a home should flow together and make a beautiful and seamless transition! And one of the biggest ways to do that is to keep the wallcolor consistant throughout the house. Painting rooms in your home too many different colors! This decorating mistake can make an entire home look disjointed and confusing. 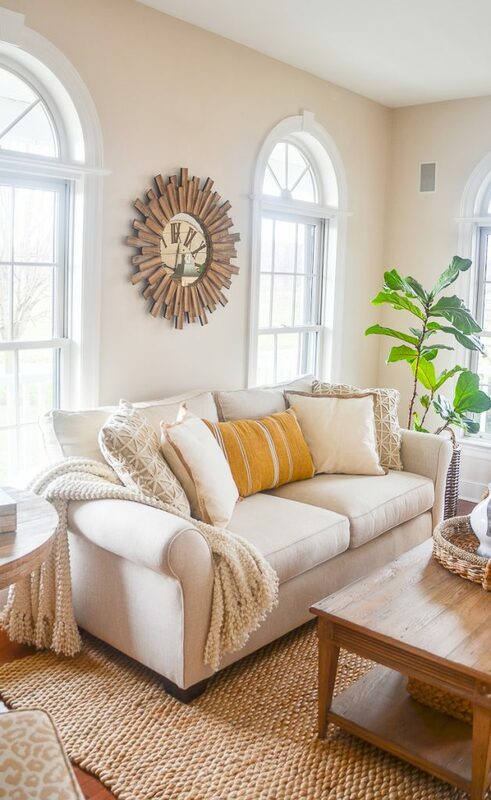 No matter how much you might try to make a home look cohesive it won’t! Choose a paint color that will work in most of your home. And get to it! Also, you can choose a few paint colors, but build a color palette for your home around them and stick to those few colors. all the trim of a home should be painted the same color, period! 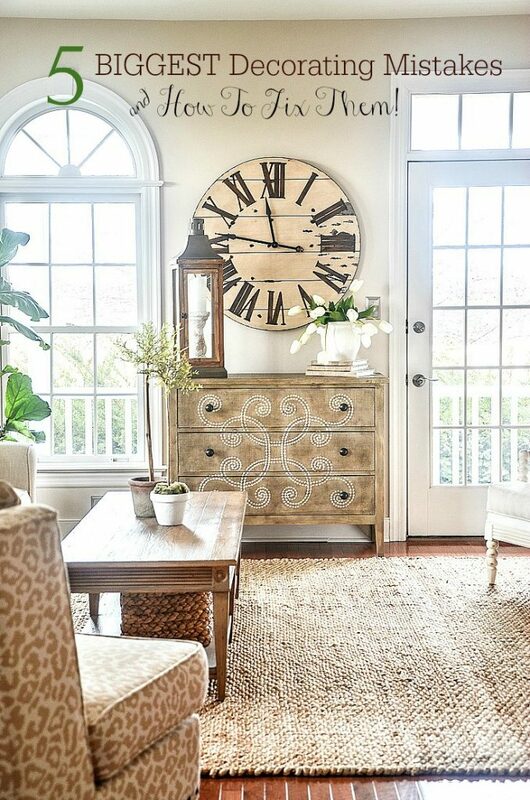 I cringe when I see a small rug trying to pass as a great way to bring a room together. NEVER use a rug too small for a room. It screams “I’m a decorating mistake”! Using a rug that is too small for a space. Oh, goodness! 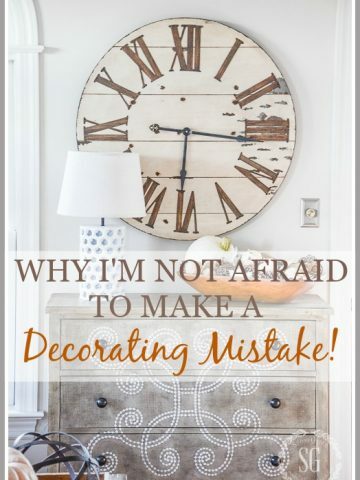 I’ve made this decorating mistake a few times! So learn from me! Just recently I chose a gorgeous chetah inspired rug for the living room but when it came it was too narrow! UGH! And I know better! Many rugs in magazines and on blogs are really too small! They look lovely because the design around them is perfect. And you only get a “beauty shot” that does not show the entire room. 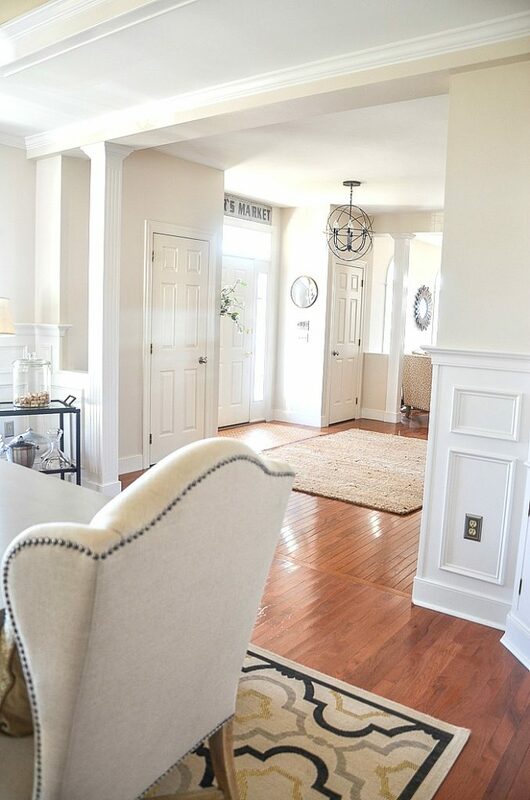 If a wide shot was taken of the room the rug would show up as a glaring mistake! A rug should fill a good deal of the floor space in a room. 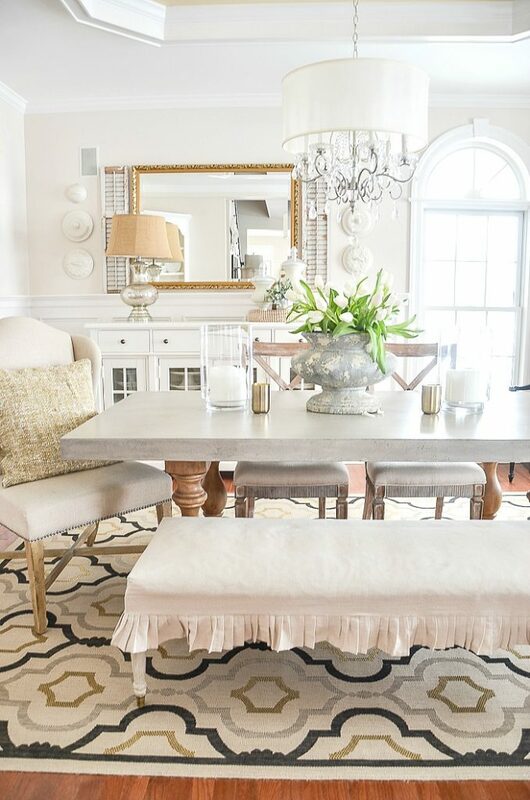 Don’t be fooled into thinking a rug looks fine only under a coffee table or a little bigger than a dining room table. And please make sure a rug sticks out on all sides of the bed it sits on and has lots of rug showing! A great way to fix a too small rug is to put a larger very neutral rug under it. 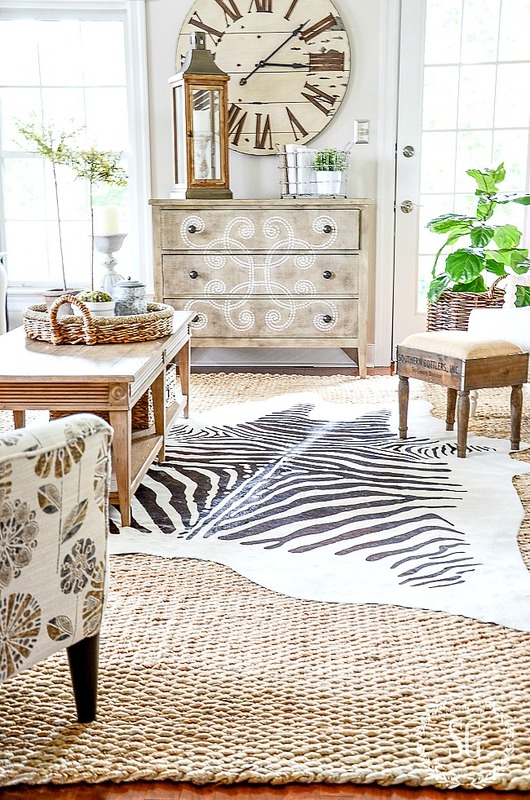 Like sisal or another natural fiber rug that fills the space. It is an easy fix and will add texture to a room too! Here’s a very informative post about HOW TO LAYER A RUG LIKE A PRO. And always, always, always know the return policy of any online rug you buy! So if it is not perfect you can send it back. You might take a second look at the curtains in your home. If your curtains are not hung as high as they can go on a normal height window and room then they aren’t creating beauty in a room! And on the other side of the decorating coin are curtains that do not touch or trouser crease or puddle a bit on the floor! This is a big decorating mistake and the beauty of a room will be hurt by this, big time! HANG EM HIGH AND SWING EM LOW! 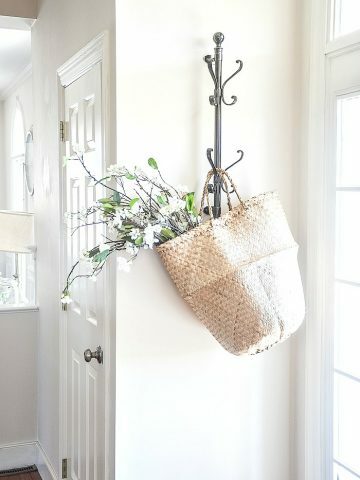 You don’t need expensive and heavy drapery anymore! They are very very dating. Go for a simple straight curtain that hangs as high up to the ceiling as possible and make sure those curtains brush the floor! Or think about getting rid of curtains all together! I just did! My living room and dining room look much fresher without drapes! Okay, don’t get mad at me for this… especially if you are over 50. But I can’t stand matchy-matchy furniture. It screams, “I bought the entire set all at once at the store because I am not creative enough to do it myself”! Way back when it was the style but not anymore. Actually, it’s not been the style for a couple decades or so. I was a matchy-matchy buyer once too! My dining room table and chairs and buffet all matched and so did my bedroom suite ( OR set). When you see or hear the work “suite” (or set) it is a dead giveaway! Furniture bought for a whole room that matches! Buy individual furniture pieces you love for a room and coordinate them! Even my slipcovered family room furniture, although white, are not the same color or material. A little difference adds interest and life to a room! Over the years I’ve gotten rid of my big, beautiful, bulky, 18th-century mahogany buffet and painted a vintage piece to be a buffet for extra dishes. I lived with that buffet for about six years and now have a more contemporary buffet with a bit of a modern farmhouse twist! I painted and reupholstered my 18th-century mahogany chairs and eventually replaced my 18th-century table with a very updated concrete one. My painted chairs were eventually given away and I replaced them with four trendy ones I had my eye on for a long time. With every step of the makeover, I liked my dining room more and more. And the key is “over time”. It took seven years of little changes for the dining room to look as it does today! If you love the set you have then that is wonderful! 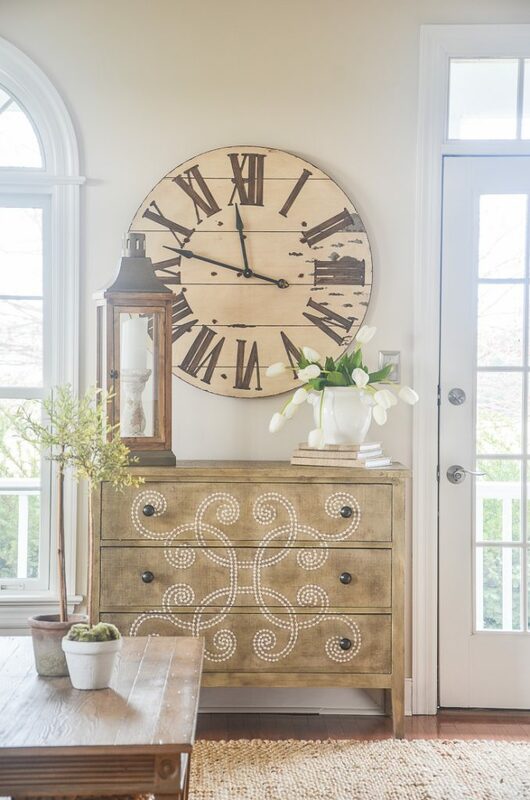 But if you have any matchy-matchy furniture you are feeling stuck with begin changing things out a little at a time! My furniture is no longer matchy-matchy and I love being free of that “all one color wood” look! Oh goodness, this is a no no! Most overhead lighting is ghastly on it’s own!!!! Even if you have the prettiest chandelier you should still have some great table or floor lamps. Only using overhead lighting is a decorating faux pas! Overhead lighting is hard on the eyes and throws off harsh shadows. It is not a light becoming to humans!!!!! We don’t necessarily have to get rid of overhead, but do add more lighting to work with it! Think of light zones in a room. You want to overlap pools of light given off by lamps. Make sure there are no dark areas or corners. And remember you don’t need to use the same wattage in every lighting fixture in a room. Put lamps on dimmers so you have pool of soft overlapping light in a room. If you have made any of these decorating mistakes you are in good company!!! And if any of these mistakes are living in your home, now you know how to fix them. Decorating is not a contest or a race. You don’t get a blue ribbon or trophy. It is individual and personal and a big wonderful learning adventure!!!!! Embrace it! Embrace all your wins and decorating mistakes because they have helped you to make your house the home you love!!!! 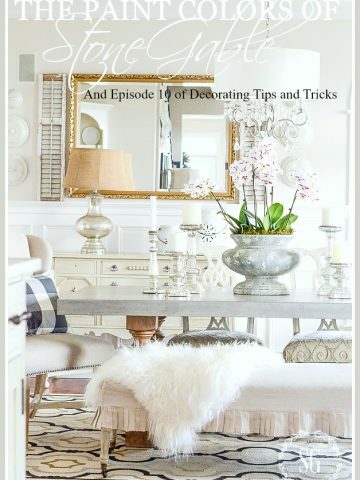 Sign up for my latest ebook of 50 (more like 100) inspirational decorating ideas! Oh, how we have made mistakes over the years. Even though I know better, I didn’t live with the paint swatches on my wall long enough and ended up with WAY too light of blue paint in my house, it actually photographs white. Ah, well, paint is easy, it will be changed…eventually. Great fix’um ideas! I try to use the rugs that end up too small in another location of my house. That is an advantage of a neutral pallet. The most costly mistake I made was buying the wrong lights that hang over my bar. Paid the electrician to hang them and then realized I had a big OOPS. Since they were custom ordered, no return! So I painted them! I loved them when I ordered them but not the darkness. Paint heals many mistakes. I love the harmony the neutral colors produces. The style combines coziness with elegance seamlessly. My fiancee is going to love it. I remember when you were able to buy the whole set of matching furniture you really felt like you made it in the big leagues!!! Before you hang a washable curtain, wash them. I found out the hard way… they pooled 4 inches on my floor prior to washing them according to directions. Now they are 2 inches above the floor. These were pricey cotton curtains from W.E. I need to live w them for now and when I repaint in fall I will lower the rods. Yvonne, note comment below! Any ideas would help? I’ve checked the box on every one of these. I always hang my side panels high and make sure they break or touch the floor. My rugs are big enough, my walls are all painted the same colour throughout ( a soft cream), my furniture is mixed and I have several light sources. The only room that needs addressing is my bedroom. I replaced my bed with an upholstered one and love the fresh look. But, my night tables, tallboy and bureau match. I love the lines of the pieces and it is high quality. What would you suggest I do? Paint the night tables? How do I break up the set without replacing all? Joanna, I had the same challenge! So I swapped the dresser from another bedroom. I painted it and my end tables with a whitewash to soften them. Just an idea! Thank you Cecilia! I think I’ll paint my night tables and see if that makes a difference. I always struggle with paint colors.Even going with neutrals, the paint gives off a green cast due to natural lighting and tinted glass on my sliding doors.I am going to paint my front door and am trying to pick a color, charcoal grey or black, both have many shades ! What really gets me on my soapbox is when I read ‘paint is a cheap and easy fix’ or ‘if you don’t like it, it’s just paint, redo it!’ Like magic painting elves will drag their tiny tushies up/down that ladder for hours and wielding that roller overhead like so many Flying Wallendas… good paint is NOT cheap, and painting is HARD especially when done well. Yes, I hired out my last painting job but it was really, really expensive and in the end not as exacting as I would have liked it. Read: drips I’m still finding in really odd places. I’d better get off this soapbox before I fall down! “real world.” I wish you the best.